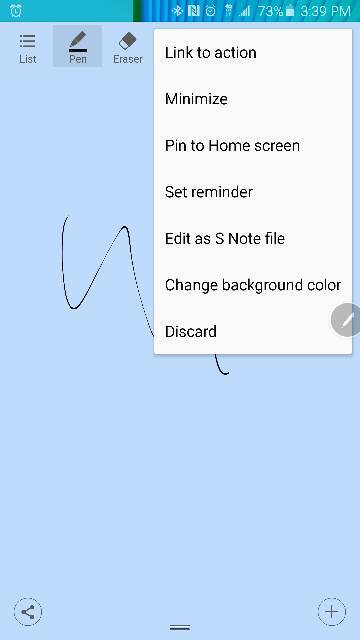 When you write an action memo, click more and then click pin to screen. It will put it on your screen and you can resize it. It's not there for me. I don't have my Note 4 with me at the moment, but pretty sure I've seen it there (never used it tho). Did you download the extended features? Mines there and I downloaded them. Yep, have to have the add ons. If you are using a third party launcher like Nova you will loose this option. I use Nova, switched back to TW and checked. It's there when I'm on TW but gone when I switch back to Nova. This is one of only a few options you loose when using a third party launcher. I agree, however if you use OneNote, you can set a desktop shortcut to any OneNote page. 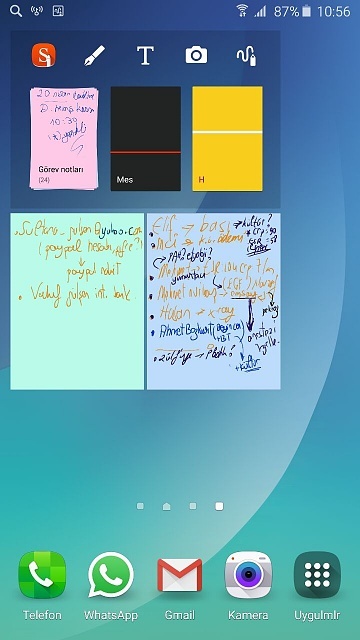 So I have a daily "Quick Notes" page in OneNote that I use for running notes throughout my day. Works on Nova just fine. Thank you for clearing all that up! OneNote it is then! I knew it was a feature because they showed me on the demo. 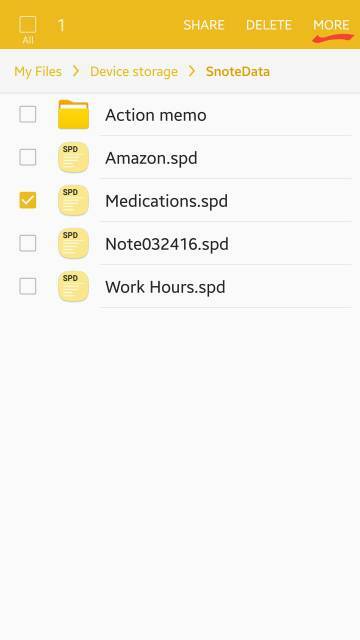 I realized that since I had evernote installed it was my default account for saving s notes and action memos. 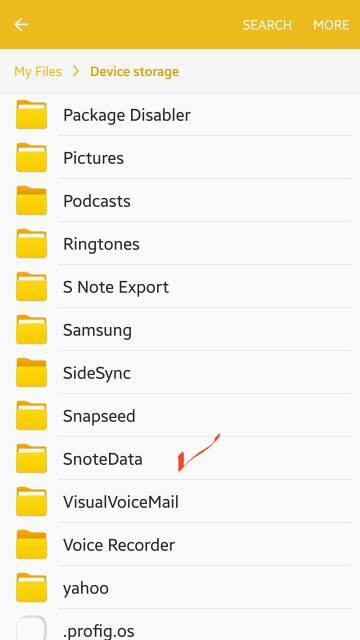 On my note 4 that didn't seem to make a difference but on the note 5 even with the additional features installed you can't do it unless you set up your samsung account and then in the s note and action memo settings making sure it is the default account. Only a slight bummer for me since my previous sketches and notes were in evernote from my last phone. But try and look into that. Good luck everyone. 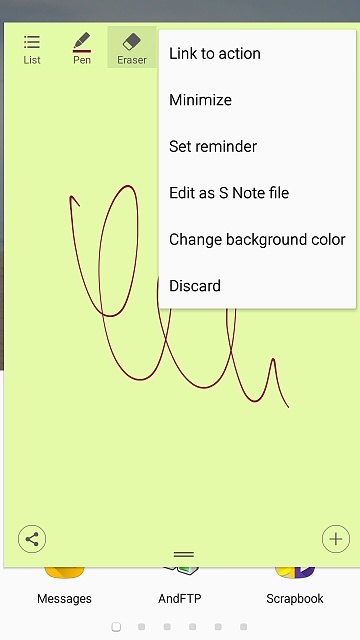 Is there a way to display a preview of the S note in Note 5 ? The same as we do with task notes. You can do it with a little work. 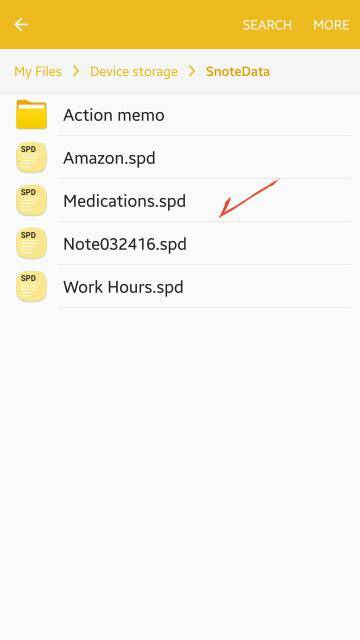 memo you need and select more. 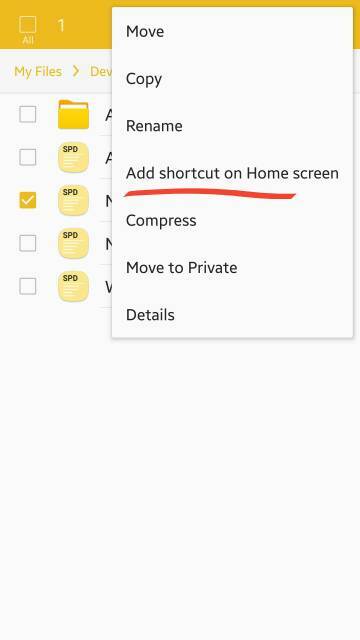 Click Add shortcut to home screen. 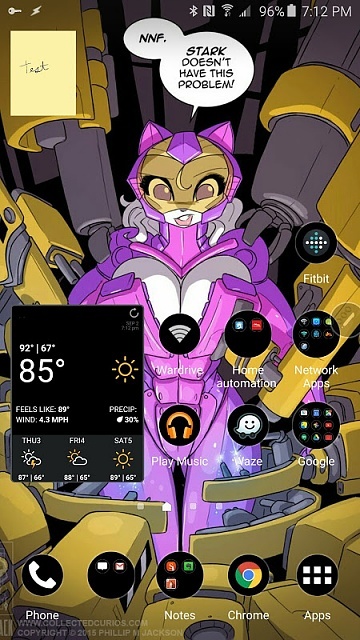 This works for Nova launcher. After you do it a few times, it only takes few seconds. sandra_17, felma and novice like this. You can do it with a little work.... After you do it a few times, it only takes few seconds. THANK YOU! I have Nova Prime - took less than 5 seconds. Thank you, thank you! This was very sorely missed for me. 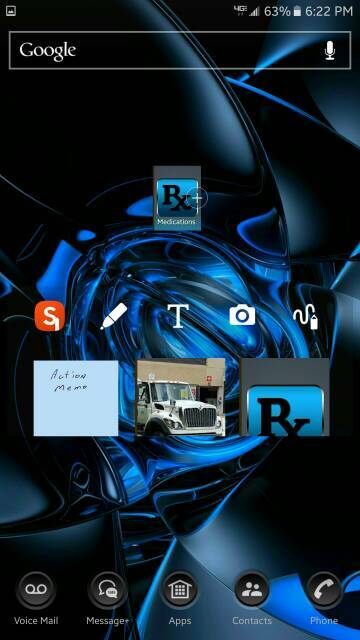 I'm not sure how to resize but you can minimize a note so you would have the floating note icon on the screen. 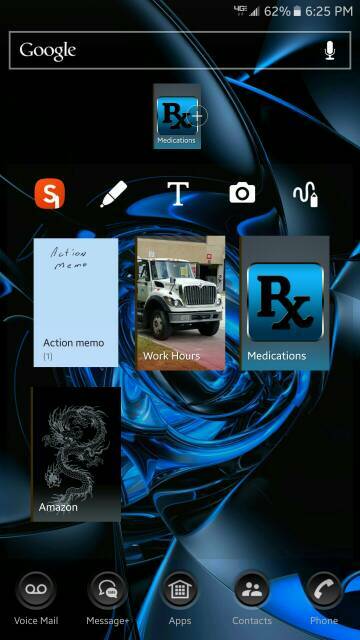 You can drag an Action Memo up from the bottom and make its height shorter but you cannot make the sides narrower. How about my question? Any similar Genius answer? Let me try to explain it this way TJA. 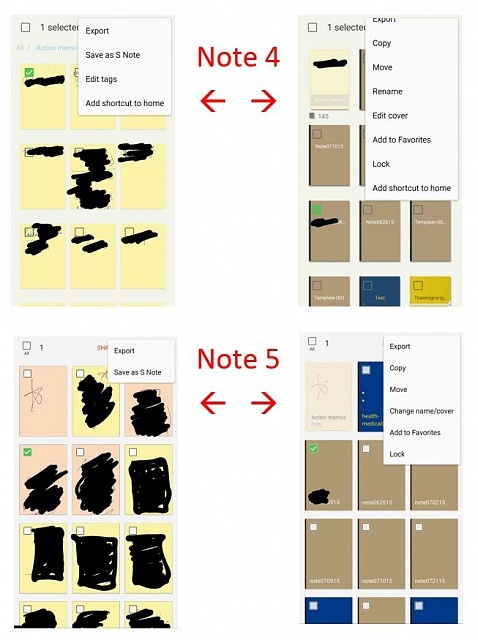 So as in the photo i may display previews of action memo (mid-size blue and green notes on the photo) but could not find a way to do this with S notes ( notes entitled "mes" and "H"). That is, i have to do a second click to open and view what is inside "mes". That would be amazing if you had a solution for this. Why are my jpeg pictures turning to png files after I edit them on the galaxy s4? How can I get my camera to initialize?